‘Wired for Madness’ is out on April 19 via Music Theories Recordings / Mascot Label Group. Jordan Rudess is no stranger to anyone in the progressive rock & metal worlds. The man behind the keyboard world of prog titans Dream Theater has a huge resumé to back him up. The announcement of a new solo studio record left fans very excited about what he would come up with next. He has released albums more on the classical piano side and some more on the instrumental progressive side that we’re used to the most. While his new effort, Wired for Madness, definitely fits better in the latter category, it is much broader and more experimental. Solo albums are usually where musicians take advantage of the fact that they have no strings attached to a particular band or style – Rudess takes that idea and runs with it. This allows him to have a wide range of special guests appearing throughout the album including his Dream Theatre bandmates James LaBrie and John Petrucci as well as Marco Minnemann who plays drums for most of the album and many others – some may be surprised that Rudess handles the lead vocals on most of the record. The main attraction of the album is the 35min long title track “Wired for Madness” which is split into 2 parts. “Part 1” starts off with ominous robotic voices and sounds, which are then followed by a classic Rudess bass synth riff. When drums and a dozen of other keyboard sounds enter, you can start to get a feel for the album right off the bat. Rudess’ inspirations are very apparent with a few Keith Emerson or Rick Wakeman sounding sections. The instrumentation is incredible and a lot of it naturally reminds me of Dream Theater and Liquid Tension Experiment. The interesting part about it is you can see what Jordan brings to the table to those bands composition-wise by listening to his solo work. During this first instrumental segment, you go from a John Petrucci guitar solo to a full-on jazz section to a quirky synthesizer one. It’s absolutely crazy and it works! 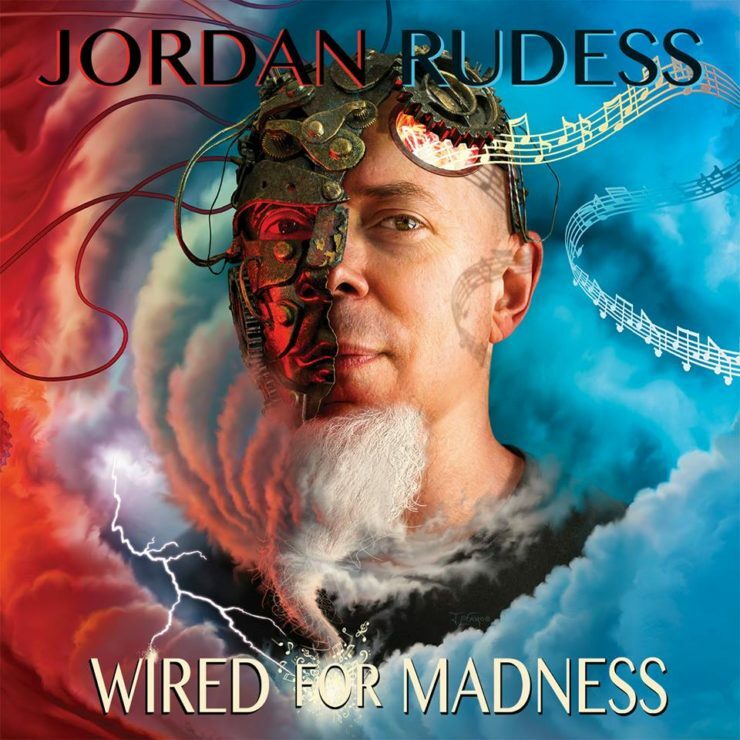 Still on Part 1 of “Wired for Madness”, we’re introduced to a smooth Vinnie Moore guitar solo, a fast brass synth section and more mind-blowing solos by Jordan. This leads to a very weird and abrupt transition to the slow vocal ending. This is where Jordan’s vocals enter, and it works here but doesn’t really add anything special to the song, especially considering how short the vocal section is. “Wired for Madness Pt. 2” (the longer of the two parts) also starts with a buildup – this time it adds some eerie vocal melodies that are complemented by strings before the full band comes in. The beginning of this song sounds insanely good and particularly Jordan’s first keyboard solo. Despite having the same name, the second part already feels very different than the first. A drum interlude leads to a welcome but unexpected heavy guitar riff driven section. Then it drops to another slow section with vocals that don’t really add much to the song. Thankfully, it’s preceded by a nimble rock organ solo and more whacky instrumental antics – in fact, some of the best moments in the album are in this middle section – there’s a lot of attention to detail with the sounds Jordan chooses and it’ll be easier to notice if you listen with headphones. Every transition here feels organic, no matter how disconnected the sections may seem individually, and this is an unparalleled achievement for a composer. From there Jordan introduces one more long instrumental section, a bit reminiscent of the ones we’re familiar with in Dream Theater but with a few twists, shredding, piano solos, ragtime jazz – you name it – it’s as incredible as you would expect. To finish things off Jordan brings in James LaBrie for one last final vocal section. If it was supposed to feel like an emotional send-off to a long epic track but it falls short a bit. James’ performance is on point, but the execution isn’t the greatest because overall the song still feels like more of a long instrumental and it’s not easy to get emotionally invested in it – ending it with a ballad feels slightly incoherent. Altogether the title track has an array of amazing moments and is very varied in styles, just like the rest of the album. You’d think that with a huge undertaking that is a song like this must be, the rest of the album would feel like filler but it’s quite the opposite. Some of my favorite moments in ‘Wired for Madness’ come from these tracks and they help to solidify Jordan’s overall vision for this record. Following the title track, you have “Off the Ground”, a beautiful ballad sang by Jordan himself. This time, the song and melody are perfectly contextualized with each other and the harmony works flawlessly. The same can be said about another ballad that comes later in the album, “Just for Today”, which features a beautiful piano solo. These are great contrasting moments considering the rest of the record’s higher octane energy. There is also more instrumental craziness in the form of “Drop Twist” and “Perpetual Shine”. Both of these tracks deserve a lot of love. While the former plays a bit safer on Jordan’s strengths, it’s still phenomenal. Perpetual Shine, on the other hand, is probably my favorite track in the whole album. It has a wonderful 90s Jazz fusion vibe akin to Dave Weckl’s or Allan Holdsworth’s greatest instrumentals. If you don’t have enough time to listen to the whole thing but still need your instrumental fix, these are your two go-to tracks. “Just Can’t Win” is a straight-up blues song. The piano, guitar, drums & brass. Very different from anything else on the record and that’s what’s I love about it. Jordan goes all out singing this one and with the addition of Joe Bonamassa performing two jaw-dropping guitar solos, it just takes this one to the next level. To finish off the album, Rudess chose the ideal closer “Why I Dream”. This song encompasses everything he’s trying to achieve with this record and he makes it work. It’s a faster song with good vocal melody, a catchy chorus, and the instrumental segment is bonkers as usual. He put his all into the last solos and it’s clear this song was made to fulfill his vision to what ‘Wired for Madness’ should sound like as a whole. Although I have critiqued of some of Rudess’ choices throughout the album, I absolutely support them. Every artist needs to challenge themselves in order to grow. We might think someone like Jordan who’s been in the music business for years while also being extremely gifted would have checked all of his boxes but it’s clear he wants to push himself further – and that’s very admirable. Wired for Madness has its highs and lows but it’s one of those albums that I see myself coming back to very often. It has musical variety, first-rate production and the classic Rudess style we all love. It’s a very welcome addition to his catalog and I recommend it not only to his existing fans but potential new ones as well.